At present the St Mary’s flower group, led by Blanche Williams, consists of 15 enthusiastic members, some of whom are professional flower arrangers. New members are very welcome and should make initial contact via the Parish Office. The team has a fortnightly rota of three members who are responsible for vases at the West End; by the pillar in front of the Altar; and in the niches on either side of the Altar in St Leonard’s Chapel. The team members are responsible for keeping their vases fresh and watered during the fortnight. All members meet in the Chantry House to make posies, which are given out after the Sunday service on this special day. 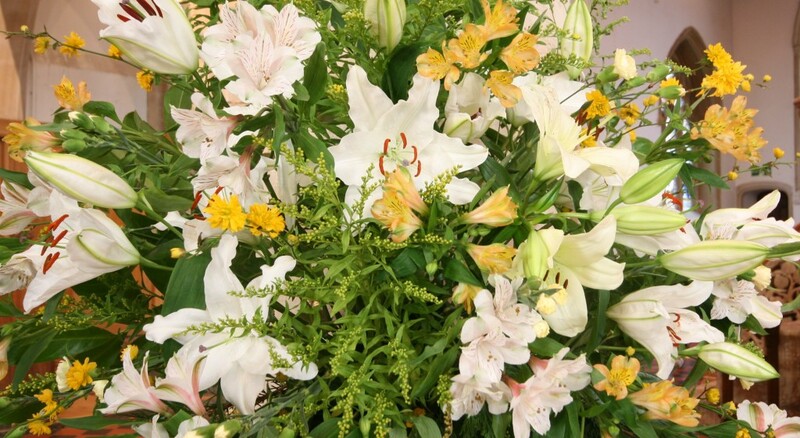 At Easter we have a special collection for the Church to be decorated with lilies, and people are invited to donate ‘a lily in memory of a loved one’. During Henley Royal Regatta week we decorate the Church in a pink theme, as this is the colour of Leander Club. All the team members gather to assemble as many arrangements as possible, in bright colours, with fruits, berries, and a Harvest Loaf, to make St Mary’s an especially joyous and festive place each November. The festive season is an occasion when the whole team can meet for lunch and discuss our plans with a usual colour scheme of white, silver and gold. Several years ago we all had fun making red banners with white angels to hang on the Church pillars on either side of the aisle. Once the wedding date has been confirmed, arrangements are made to meet the bride, her family, and chosen florist, to discuss and offer advice on the various arrangements. Occasionally the flowers are transferred to the reception afterwards, in which case we ask that at least two arrangements are left in St Mary’s.